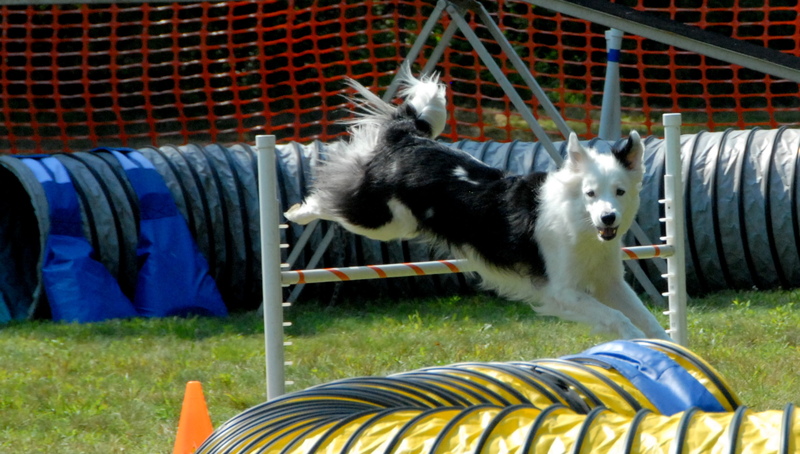 Scraps entered to run two days at the NADAC agility trial sponsored by SCOR Agility to be held on July 17 through 18, 2010 at the St. Huberts training field, Chatham, NJ. The weather on Saturday proved to be hot but the humidity wasn’t too high and there was no threat of rain, so while it was a semi-scorcher, in the low 90s, the weather was on our side. At least we had a site somewhat in the shade with a good view of the field. We have to remember that location under the big tree for the next time we trail at St. Huberts. 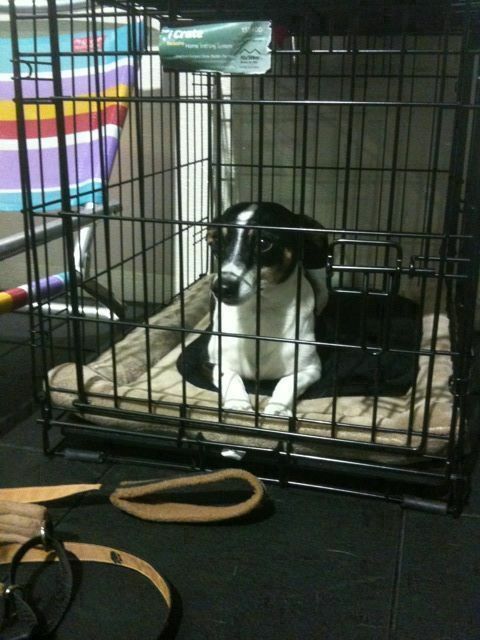 As usual, Scraps is competing in this trial on virtually no recent formal practice or training. It was amazing that his first run of the morning was quick and confident and qualifying. More surprising, he came in 2nd place on that run by 3 seconds. Typically, if Scraps qualifies he comes in first place since he is pretty fast but this is NADAC, not CPE, and it is more challenging. Scraps jumps at 12″ in NADAC not CPE’s 8″. Speaking of which, Scraps did get measured officially and we filled out a form so hopefully we will get his permanent NADAC height card and not have to get measured again. This may buy us 10 more minutes of sleep on trial days since we won’t have to get measured again. The next 3 runs Scraps failed to qualify as he was having trouble hitting the contacts on the dog-walk, and in NADAC, miss one and it is “NQ” for you. Additionally, Scraps was spooked by something in one of the tunnels which impacted two of these three non-qualifying runs. To end on a positive note, Scraps ran well and qualified in the last 2 runs of the day. This included a weavers which required him to complete 3 sets of weave poles in one run. Hoopers, the last event, was slow, methodical and most importantly, qualifying. The trail seemed quick and well run. The SCOR ladies are getting good at it, so we were done and on the road by 4:30. That is pretty early for a Saturday of a full weekend trial. Time for a well deserved dinner, drink and rest. Tomorrow we do it all over again. Until then, enjoy the videos and photos from the day. Day two started off nicely with a qualifying run and a first place ribbon. Sunday seemed just a little cooler than Saturday but the weather was quite similar, moderate humidity with temperatures in the low 90s. Fortunately we have shade and an occasional breeze so we were ready to go and go we went with an early morning qualifying run. Tunnelers did not go as smoothly as the other two runs but Kathy kept he wits about her and kept Scraps under control and the two of them managed to pull a “Q” out of their collective asses. I think this run really showed the experience of the Kathy and Scraps team to come out of a run with a “Q” when they don’t have their best stuff. This was followed by another qualifying run and first place in touch N’ go. The fifth run of the day was regular, and from the looks of it, it seemed as if it was a gift, at least that is what Kathy stated beforehand to jinx the run. It was going well up to the weave poles where after 4 or 5 attempts, Scraps just couldn’t find the focus to get through them. It probably wouldn’t have mattered anyway as he missed the contact at the end of the run. The day and the weekend concluded with an attempt at chances in the novice division. This has the line you can’t step over and you have to make you dog perform obstacles at a distance. They were going well and even recovered from when Scraps didn’t enter the tunnel with some excellent handing on Kathy’s part but when it came to a 50-50 decision of A-frame or tunnel at a distance, Scraps took the easy tunnel of a gut-wrenching NQ right at the end of it all. Nothing to be too upset about because NADAC is more exacting than CPE and we came out with 7 qualifying runs out of 12 attempts. We may get to move up in a class or two as a result of the weekend so it was a really nice trial to participate in. It has been a snowy winter and we have all been cooped up for too ong awaiting springtime. 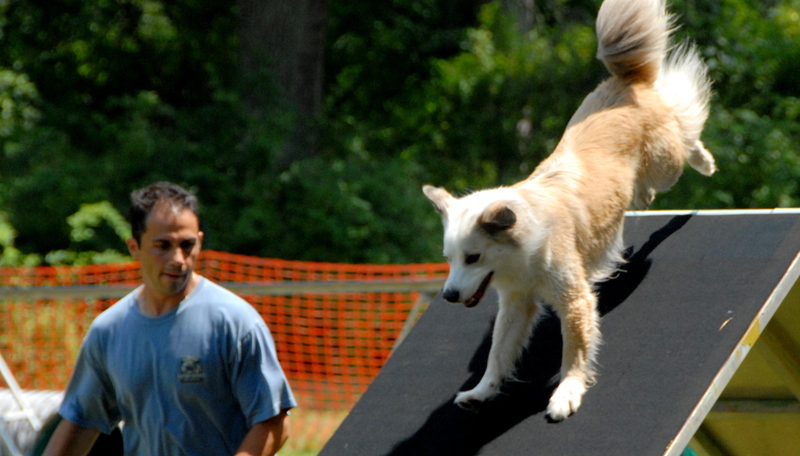 Scraps the Dogs is no different so we tool an opportunity to practice a few agility runs at the K9 Campus located in Randolph, NJ. These were short indoor runs on AKC aproved equipment. This meant nicely ruberized planks, teeters and frames as well as a chute which Scraps hasn’t seen in years. He hit the chute 50% of the time and di well on the frame and plank as well as jumps, including a broad jump. His weaves were weak at best. Overall an ordinary day but a day of practice in better than none at all. Looking forward to some competion days in the summer. Two posts ago we discussed and showed how we tried to teach Scraps how to do the teeter. While we eventually got him to go over the apparatus, it apparently wasn’t the St Hubert’s endorsed teaching style for long term success. Kathy enrolled in a 4-week teeter class for Scraps and it quickly turned into 2 4- week teeter classes as progress in this class technique can be agonizingly slow. Sherri is our teacher and she is a pip who is happy and has fun with the dogs. There are actually a lot of people in this class working their way through the inch by inch progress of Sherri’s technique. 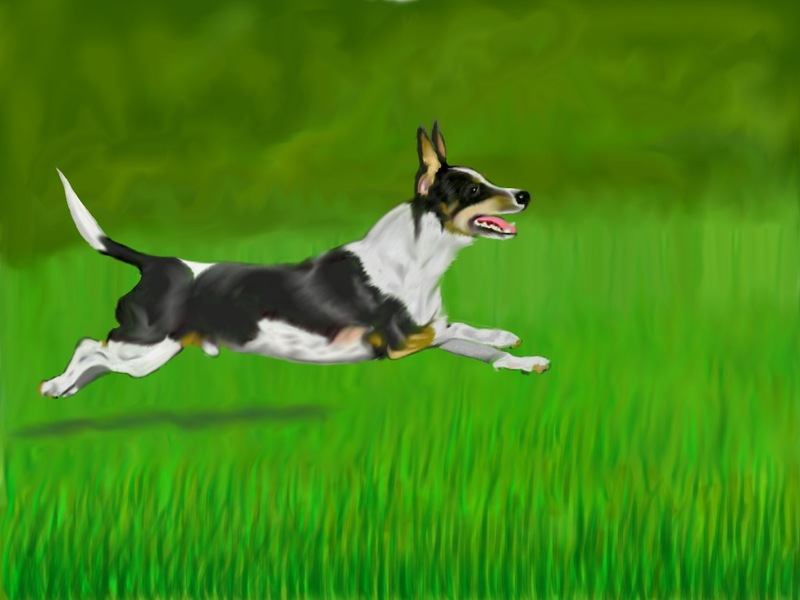 Enjoy the couple of videos I posted and let us hope it all pays off in the agility ring. On a cold Valentine’s Day Saturday morning, Kathy and I begin our much needed around town training with Rags. We can hopefully teach her some manners as she walks in and about other people and dogs. We will see how it goes. In the mean time it’s time to gather her papers, the chopped up cheese and her gentle leader and off we go. Fortunately for Rags the gentle leader was all twisted and we couldn’t get to work so Rags practice all the time just with her harness on. So we get to class and there is a lot going on in the St. Hubert’s parking lot. The previous class is still in session and there are lots of dogs all over. We wisely used that time to practice a little walking around all these distractions until we were let into ring #2. Once in Ring #2 we discovered Leah Hartley was our teacher and there were only 3 other dogs in the class. This gave us lots of nice personalized attention along with the nicely attentive TA, Karen. Leah interviewed us to see what we wanted to get out of the class and then she tested us all on our sit, sown stays. For the first time in my life I was able to walk around rags while she was in a down-stay. She was unbelievably well behaved and never once barked at any of the dogs in the class or other distractions we encountered along the way. It was a real worthwhile experience. On the way home we stopped at the Swiss Chalet for breakfast and we saw Adam Batt roll up on his bicycle in his winter biking outfit where i didn’t recognize him. I thought he was one of the schleps from the Marty rides. I now look forward to our 3 other classes in this around town mode. Great stuff for Rags. 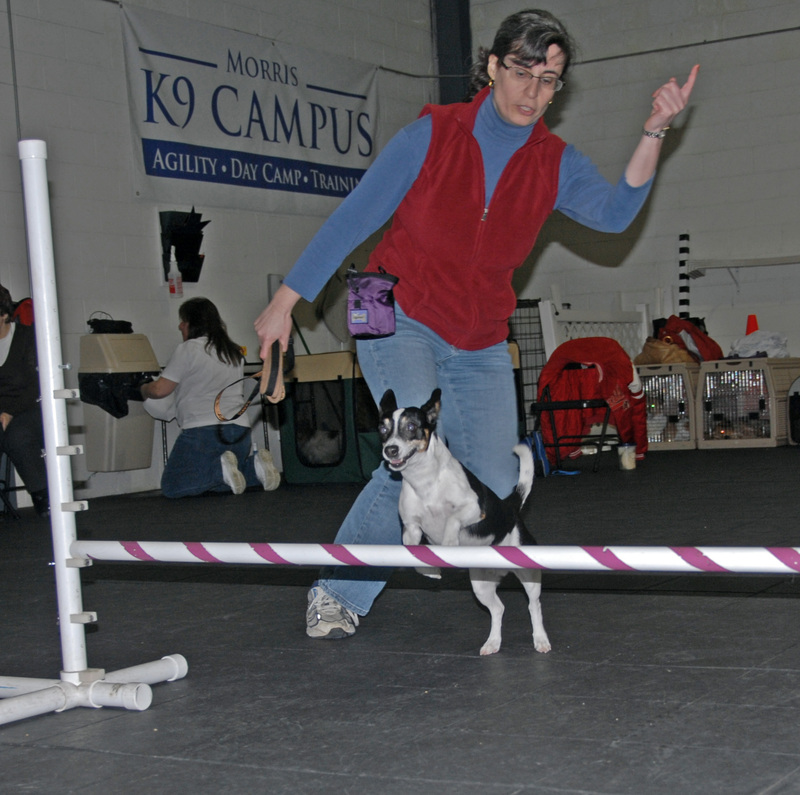 I did the second class by myself without Kathy, and in addition, there were only 3 dogs in the class and 2 instructors. Needless to say, we received a lot of personal attention. This class focused on “leave it” more so than anything else. It meant to leave the treat on the ground, leave the fire hydrant, leave the pedestrian, etc. By then end of the hour Rags was really responding to the cue. All the practice Kathy does in the basement really pays off. Reward with a treat when she makes eyes contact with you after being given the “leave it” command. I did the third class by myself and it was just me and another big dog with the two teachers. Once again very specialized and focused training. I got there 3 minutes early, parked in the Stop and Shop Parking lot giving me some breathing room to get Rags settled in. “Say Hi” to stranger with rewarding for sniffing their palm. 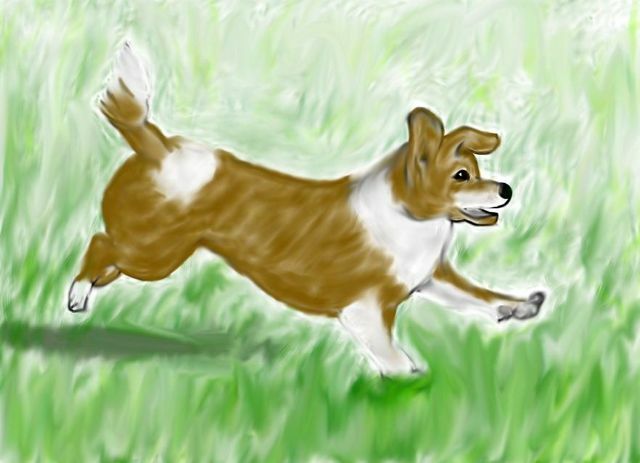 A recall practice to practice “here” when distracted by a piece of food or getting treats from a stranger. 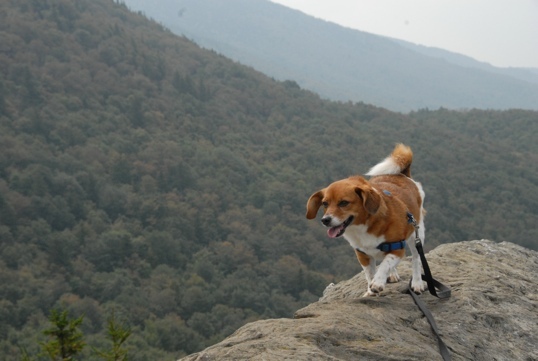 We used the long lead on this one to give a little tug when they ignored the “here” command at a distance. Walk behind me on the left. Teach Rags to only walk behind me on the left. A wall on my left shoulder is a great technique tpo learn and practice this action. In addition, using my left foot to block here advancing in front of me helped. A really good class overall, I feel we made good progress today. In the end it was a very beneficial class now if I remain focus and concentrated with Rags on the leash she will come around to act like a dog that doesn’t embarrass me every time a distraction approaches.